But, it's still beautiful outside & here I sit in front of my computer to write all of this because I want to remember. Fun times are important to remember. A little while ago, Google Play offered a free download of Duran Duran's new album (are they called albums anymore?) Paper Gods - the title track is brilliant! I downloaded it & then kinda forgot about it - which was stupid because it also features Janelle Monae & Nile Rodgers (check out this song here). I was driving to work, shuffling songs, when one came on I didn't recognize. My first thought was I didn't download this, & then Simon LeBon's voice kicked in & happiness kicked in & I smiled all the way to work. And this song got stuck in my head - no complaints! A bit later, my Cousin posted on FB that she got to go to their Tampa concert & met Nile Rodgers! D2 is touring with Chic (!!!!!) & Nile is a cancer survivor. How cool is it that she got to meet him? He was super kind to her too; I will forever be a fan. About a week later, (April 11th to be exact - 'cause I know you want to know the date too ;-) I heard a woman win Duran Duran tickets on the radio. I didn't realize they would be in Atlanta that same week. She was also going to the rescheduled Prince show the day before the Duran Duran concert & was super-happy. Prince rescheduled his original Atlanta date because he was sick the week prior, which led to Prince on a Thursday night & Duran Duran on a Friday night - the same week?!? The 80's-gods aligned. So, yes, she was a lucky lady indeed! I knew there wasn't a chance I could score Prince tickets, but I figured I could for D2 - all the signs seemed to be leading to going to Duran Duran. So I did! One of my co-workers even helped me pick out seats (& parking) as he almost lives at Philips Arena & knows the deal - they were great seats! I guess I felt the need to circle it too - I was SO excited to get into the AJC Vent - anybody remember The Vent? I could write for days on how much they mean to me & how much they influenced my taste in music. I will spare you all my Duranie-ness except to say they were a massive bright spot. When I listened to their music & watched their videos, I felt so much happiness (so much fun!) & like I could breathe - as if I had been breathing the wrong way my entire life & was finally learning. Ever had that feeling? Dramatic? Maybe, but also true. With great thanks, many things have also made me feel this way: loved ones, books (so many books! ), conversations, paintings, movies, beautiful weather, photographs, even some TV shows, & lots of songs/music - lots of things. Look for these things, this Breath (call it anything/any name); it's there & it's freedom. Yeah, I really loved them & still do...doesn't hurt they are super cute too. I bought two tickets & then needed a partner in crime...my Mom delivered! 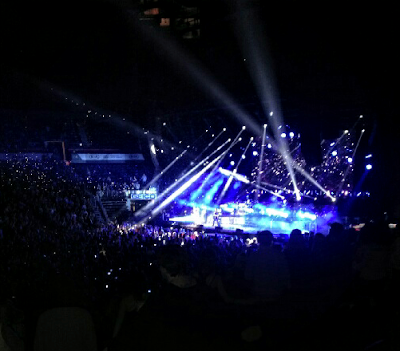 She'd never seen them live so it was perfect. To say we had fun would be a ridiculous understatement; I will say my face hurt the next day from smiling & singing so much. If I ever start forgetting things, I am going to use my D2 albums as therapy because I sang the lyrics to Planet Earth like it was still 1981! And speaking of Planet Earth, they merged it into a great David Bowie tribute with Space Oddity. Loved! 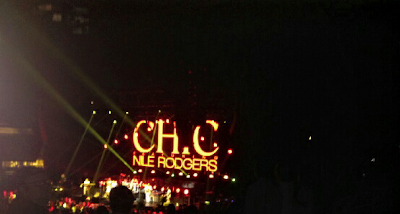 Chic - they were also AMAZING - did a cover of Bowie's Let's Dance. So freaking cool! Their show was as much about the music as it was visual art. The set had lots of very cool video & still images than ran throughout the show. True to form for Duran Duran. My favorite thing of all? They mixed New Moon on Monday into the song (Reach Up for the) Sunrise. I swooned! Swooned! New Moon on Monday has always been my absolute favorite & they don't always include it on their playlists. Happiness! 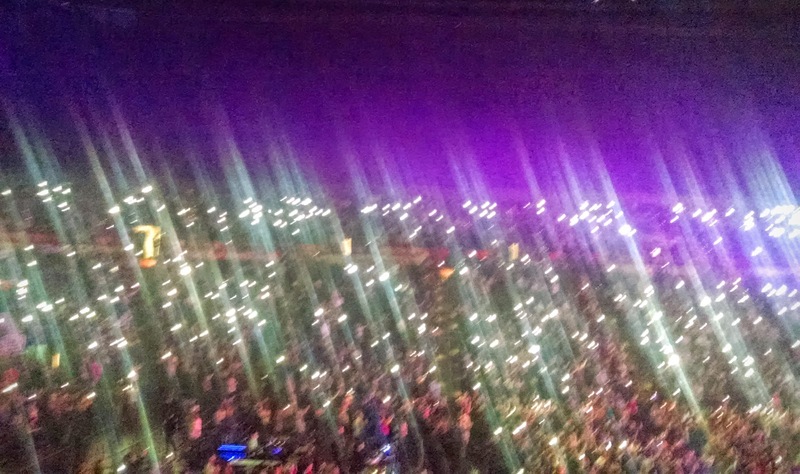 As a part of their encore, they dedicated Save A Prayer to Prince. They knew he had just been in Atlanta & explained he fell ill while flying back home. 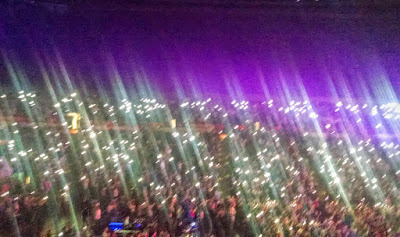 They asked everyone to turn on their phones & shine lots of light to Prince. It was beautiful. And then, less than a week later - heartbreak. To Prince, thank you for so many wonderful songs. These two songs I love, love, love. I know you are at peace & happily resting in the real Paisley Park.